Midterm elections rarely excite the general public, but 2014 is shaping up to be an especially underwhelming cycle for many Americans. With about a month remaining in the congressional races, 15% are very closely following news about the midterms — down from similar periods before the elections in 2010 (25%) and 2006 (21%). Our new survey, which was fielded Oct. 2-5, found that an additional 22% of the public said they are following the midterm election news fairly closely, 25% said not too closely, and 39% said not at all. 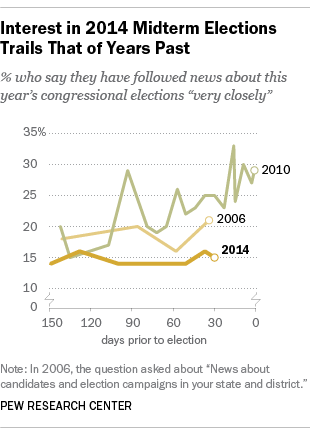 As Pew Research has tracked midterm news interest throughout the year, attention to the elections consistently has lagged behind what it was four years ago. In eight surveys this year, news interest in the midterms has never topped 16% in a given week. So what’s behind the public’s collective shrug? Perhaps Americans have gotten used to the idea of partisan control of at least one chamber of Congress being on a knife’s edge. This time, it’s the Senate, where the Democrats’ majority is very much in jeopardy. In 2010, it was the House, which moved from Democratic to Republican control. Four years earlier, the Democrats wrested control of both the House and Senate from the GOP. Another possible explanation is that so many news stories outside electoral politics are capturing the headlines in recent days. Last week, other topics in the news captured more of the public’s attention, including the deadly spread of the Ebola virus in Africa and around the world (36%), U.S. airstrikes against ISIS (31%) and problems with the Secret Service (21%). Back in March, when we first asked this year, the public was more interested in the missing Malaysian jetliner, Russia’s annexation of Crimea and the continued rollout of the 2010 health care law. In general, interest in midterm elections — with no national races and only one-third of the states voting for the Senate — vastly trails that of presidential years. One month out from the 2012 presidential election, 45% of adults were paying close attention to the campaign; in 2008, even more (57%) were following news about the race for the White House. Though news interest isn’t as high as the last midterm cycle, other metrics show that some other attitudes of the public are similar to past midterm years. For instance, about half of registered voters (51%) last month said they had given “quite a lot” of thought to the coming elections, compared with 50% in 2010 and 45% in 2006. In that same survey, 40% of registered voters said they were more enthusiastic than usual about voting in this congressional election, which is between the 37% who said that in September 2006 and the 47% in October 2010. And with four weeks to go until most ballots are cast, there is still time for Americans to tune in. For one thing, local TV will have broadcast an estimated $2.6 billion of ads by the time the midterms are over.